The Silver Oaks Inn offerss comfortable and luxurious rooms with first-rate services. 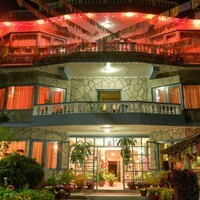 Silver Oaks Inn is located in the tourist paradise of Pokhara, Nepal (200 km west of Kathmandu). They have established themselves over the years as a leading hotel of the Pokhara area with courteous and friendly staff, spacious facilities and the best rates in town! The Silver Oaks Inn provides rooms from Standard to Deluxe, and they have an in-house restaurant, top-floor viewing lobby and a serene garden fronting the hotel where you can relax next to their famous silver oak tree after which they named the establishment. Silver Oaks Inn is located along LalupateMarg (Poinsettia Road) in the central Lakeside region of Pokhara. They have 19 well-appointed rooms, all with balconies (private and shared) and attached bathrooms. Guests can enjoy mountain panoramas from their rooms as well as the restful rooftop lobby. Views include magnificent Machhapuchhare and the Annapurna and Lamjung ranges. You can also take in from their terraces the peaceful waters of Phewa Lake and the lush hills surrounding it. The World Peace Pagoda along the ridge top to the south rounds out the marvelous scenery that can be viewed from the hotel. On the ground floor is a spacious lobby with a small library and daily newspapers and nearby is their home-style restaurant with organic veggies from their on-site vegetable patch. They have menu items for breakfast, lunch and dinner and you can enjoy meals at an inside table, or out in their pleasant garden, a favorite place to relax and take in the mild Pokhara climate. The garden features their famous silver oak tree, and is surrounded by luxuriant plants, including pomelo fruit trees, poinsettia plants and is filled overhead with colorful prayer flags. They also have a gentle swing and even a small pond with a waterfall to set the scene for peace, quiet and relaxation. Silver Oaks Inn is ready to take care of all of your needs while visiting Pokhara. They aim to make your travels as satisfying and stress-free as possible. They look forward to receiving your inquiries and taking care of you, soon!